Lafayette Choir is excited to offer a series of workshops for young singers throughout this year. These workshops are geared toward students who want to improve their singing ability, delve deeper into vocal music or simply explore vocal music. Da Capo is an Italian musical term which means “from the beginning.” Lafayette Choir is committed to providing young singers a strong foundation – from the beginning. Students participating in the Da Capo program will get to work with Lafayette vocal faculty, area professionals and our own current students and recent graduates of our vocal program who will lead some of the presentations. Topics will include vocal technique including posture, breathing, healthy phonation, articulation, and musical style. The workshops will offer students help in preparing for auditions, improving poise and stage presence, confidence, song selection, and offering sight-reading tips. We have seven workshops scheduled throughout the year and students are encouraged to come to as many workshops as they are able as all have different topics of focus. The Da Capo workshops are presented free of charge to all students. Also, all students are welcome regardless of the high school they plan to attend. We ask that students register for the program online in advance of their attendance. 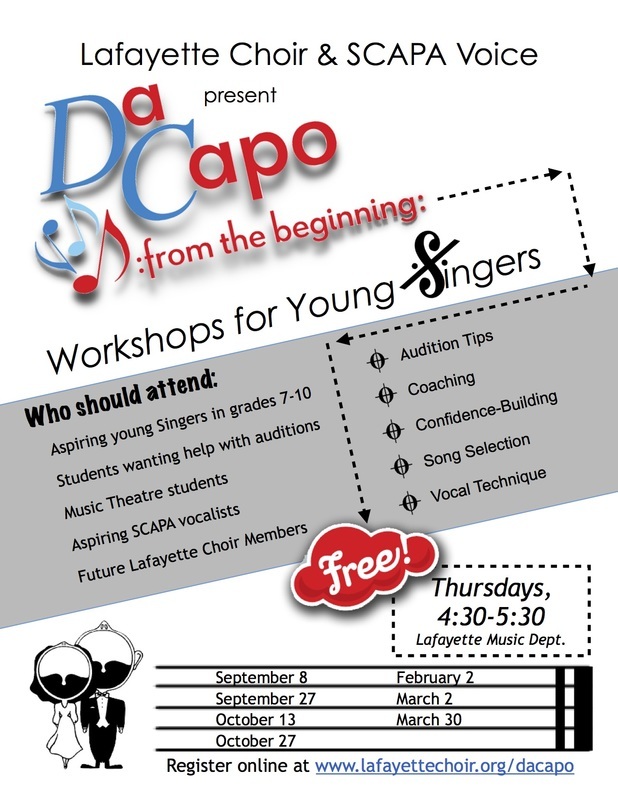 www.lafayettechoir.org/dacapo Students can register throughout the year even after the workshops have begun. Each workshop will feature a performance by a Lafayette/SCAPA student, followed by vocalises and technique instruction for all. Sight-reading tips will also be a part of each workshop. Each session will then have a different topic of focus. Lafayette Choir has a long tradition of exciting vocal music programs. Lafayette is home to the School for Creative and Performing Arts (SCAPA) magnet program. With 40 SCAPA voice majors and over 200 singers in the choir, Lafayette Choir is one of the largest and most active programs in the state. Song Selection, SCAPA Application Info. Performance style: phrasing and memorization. Presentation of songs: diction, characterization, stage presence. Auditions: preparation, presentation, confidence, appearance. Improving performance with guest coaches: utilizing feedback. Performance Coaching continued, creating a performance resumé. 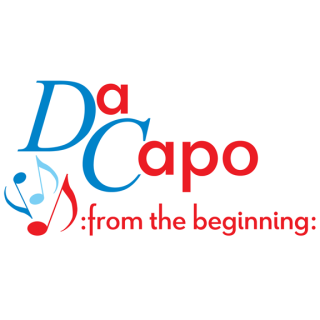 The Da Capo program is a series of seven free workshops for students who want to improve their singing ability, delve deeper into vocal music or simply explore vocal music. *Students can register throughout the year even after the workshops have begun. **Registration runs through our online store but you will NOT be asked for any payment information.